In the previous post I mentioned the extreme dangers that secretly-negotiated, corporate-dictated international trade deals pose to our fragile planet, and our efforts to defend it. A nightmarish example of such a deal is the prettily named Trans-Pacific Partnership (TPP), recently signed by – among other perpetrators – a representative of the former Northern Republican (aka Conservative) regime in Canada, just before they got the electoral boot. Due to lack of time and space, I didn’t provide details on the actual dangers of the TPP to the earth and its inhabitants. Well, here they are, in a new report just released: the dirty details of a very deadly deal. Categories: Campaigns, Climate change, Climate disruption, Climate justice, Conservation, Corporate, crimes against humanity, Current affairs, Democracy, Ecology, Economic, Energy, Environment, Global warming, Government policy, Health, International trade agreement, nonviolent resistance, Oil sands & shale gas, Propaganda, Protest, Resistance, Sustainability, Uncategorized, Water, Water protection | Tags: Alberta, Canadian government, climate change, climate disruption, Conservative Party of Canada, corporate agenda, Ethics, freshwater, global warming, Liberal Party of Canada, nature, Parliament of Canada, resistance, Tar sands, TPP, Trans-Pacific Partnership | Permalink. Shining moments happen now and then. While the big ones demand attention, small ones often escape notice. Some are in the eye of the beholder. Despite a deluge of propaganda and threats, 61%of Greeks said Όχι, No! to financial-political strangulation by Euro-banks, Greek corporate gangsters and their wholly owned media. That was a shining moment. It followed the January 2015 election of the Syriza movement to govern Greece, primarily on a promise to end imposed ‘austerity,’ a toxic mix of impoverishment and grand theft that had already devastated the country. I am hungry for these shining moments, as I imagine many of us are. The big ones don’t come very often. Our grasping at straws can make us naive, trip us up on our own illusions. A week later, the Όχι moment is over. Greek Prime Minister Alex Tsipras overrode democracy and the clear wishes of his own people to accept, behind closed doors, a set of conditions guaranteed to be even more viciously destructive to his country than the ones a strong majority of Greeks had just refused in their historic referendum. In their castles today, the international bankers and politicians who serve them are surely celebrating. They have made an example of the Greek people, as kings used to do with heads on pikes: See what we do to those who defy us. How Greeks who invested their hopes in the new government and its promises feel today, I can hardly imagine. The grief and rage of two other observers is eloquently expressed here, and here. And in a rapidly growing international protest on Twitter, #ThisIsACoup, here. But the story doesn’t end there. It continues where it always does, in Greece and everywhere else, often out of sight on streets, in markets, cafés and tavernas, in offices, schools and barracks. People talk, they learn, they unravel the lies, patch the disappointments, share, organize, resist. And so it goes. The story also continues in the turmoil and the quiet of our minds, where many small shining moments are born. Often they grow, and sometimes they bear fruit. Categories: Campaigns, Corporate, Current affairs, Economic, Ethics, Events, Government policy, Human Rights, International finance, Justice, nonviolent resistance, Population control, Propaganda, Protest, Resistance, Social media, Uncategorized | Tags: #ThisIsACoup, Alex Tsipras, Athens, banks, Bechtel, Bolivia, corporate agenda, Ethics, Greek tragedy, Iceland, International finance, Όχι, Marcos dictatorship, Parthenon, Philippines, propaganda, resistance, shining moments, Syriza | Permalink. 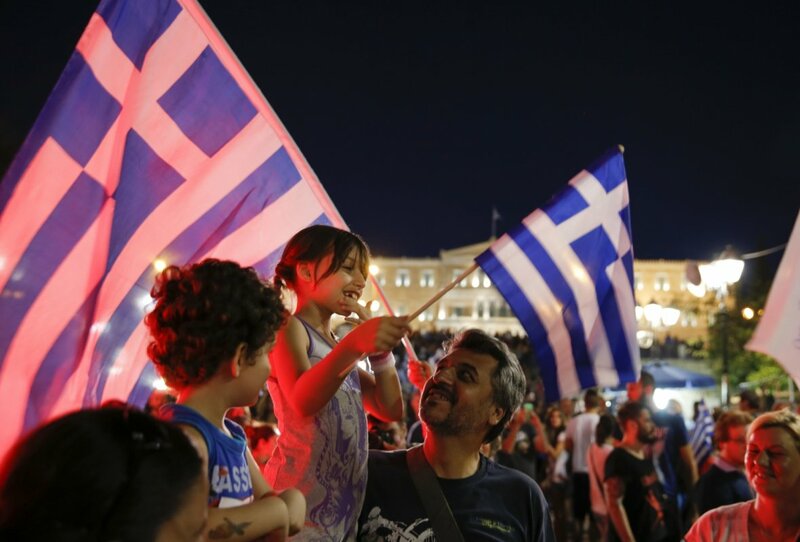 July 5, 2015, Greece: The referendum. 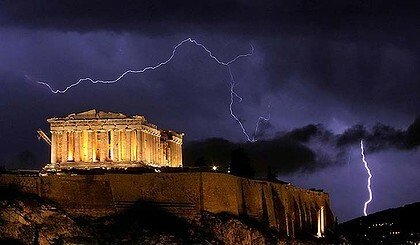 Athens, Sunday night, July 5. Photo: ibtimes.uk. This is a first, a historic moment. An act of defiance and great courage. A sharp rupture with business as usual. I’m sure that in voting No, people rejected many different but ultimately connected things: The threats and unbounded arrogance of international bankers and Euro-bosses, primarily the German Chancellor; the lies and corrosive contempt of the mainstream media; the corrupt, discredited old ruling parties of Greece; an indirect but obvious attempted coup against the government that Greek voters had just elected in January; a weary apathy born of repeated blows and letdowns; fear of the unknown, and more. But most directly, a strong majority of Greek voters rejected a power structure they know very well by now through bitter lived experience, a system that makes a decent, sustainable life impossible for the many in order to indulge the insatiable greed of the few. For people like me in other countries where No’s that challenge this power structure are routinely ignored, mocked or punished, this is a rare, thrilling moment, to be savoured. To me, the Greek Όχι echoes another famous No! During the Spanish civil war, people defending democracy from fascism boldly declared: No pasaran. They shall not pass. Sadly, the fascists did pass, and they are still with us. Even so, the original call has lost none of its abiding power: No pasaran! No illusions here: The bankers and their faithful servants in government and media are still with us. They are mightily offended by the defiance of the Greeks. They fear that this ringing No! will inspire people suffering under the bankers’ heel in other places: Spain, Portugal, Italy, Ireland, Ukraine and beyond. Syriza and the people of Greece face an enormously difficult path, a new path with no map. They will be bullied, bribed and beguiled to bow down or sell out. With humble thanks, I wish them the clarity and courage to find their own way to a more reasonable, more compassionate, more authentically democratic future. Categories: Authoritarian regimes, Campaigns, Corporate, Economic, Ethics, Events, Government policy, Human Rights, International finance, Justice, Media, nonviolent resistance, Propaganda, Protest, Uncategorized | Tags: austerity, corporate agenda, coup, coup d'etat, Ethics, European Central Bank, European Commission, European Community, fascism, German Chancellor, Greece, Greek referendum, IMF, International finance, international trade agreements, Ireland, Italy, No pasaran, Portugal, resistance, Spain, Spanish Civil War, Syriza, Ukraine, vampires | Permalink.